Earthquake damaged building. Photo: NPS files. Earthquakes result from sudden movements of the geological plates that form the earth’s crust, generally along cracks or fractures known as “faults.” When buildings are not designed and constructed to withstand these unpredictable and often violent ground motions, major structural damage, or outright collapse, can result, with grave risk to human life. Historic buildings are especially vulnerable to seismic events, particularly those built before seismic codes were adopted. Also, more and more communities continue to adopt higher standards for seismic retrofit of existing buildings. And, despite popular misconceptions, the risks of earthquakes are not limited to the West Coast (Figures 1 and 7), but exist across much of the United States. Although historic and other older buildings can be retrofitted to survive earthquakes, the process of doing so may damage or destroy the very features that make such buildings significant. While life-safety issues remain foremost concerns, fortunately, there are various approaches which can help protect historic buildings from both the devastation caused by earthquakes and from the damage inflicted by well-intentioned, but insensitive, retrofit procedures. Building owners, managers, consultants, and communities need to be actively involved in planning for and readying irreplaceable historic resources from these threats. 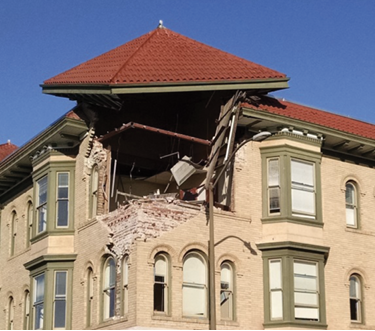 This Preservation Brief provides information on how earthquakes affect historic buildings, how a historic preservation ethic can guide responsible retrofit decisions, and how various methods of seismic rehabilitation can protect human lives and historic structures. The Brief provides a description of the most common vulnerabilities of various building construction types and the seismic strengthening methods most often needed to remedy them. A glossary of technical terms is also provided at the end of the Brief. 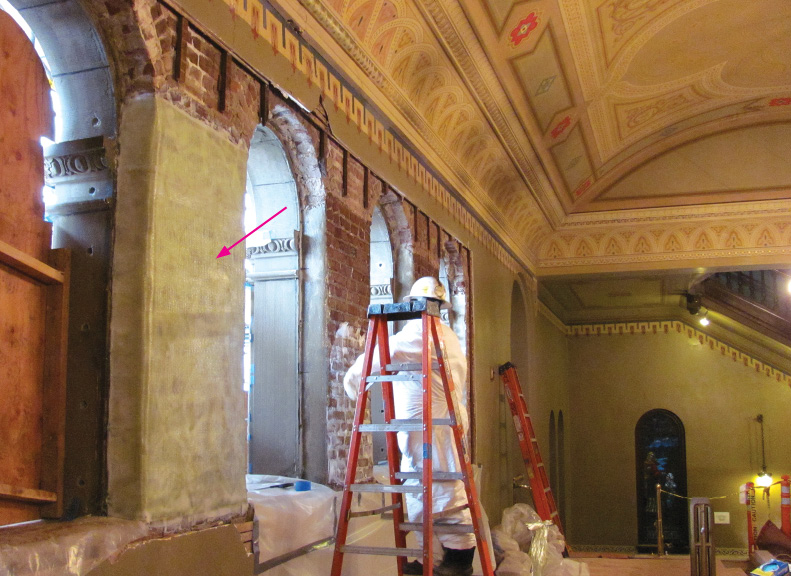 Undertaking the seismic rehabilitation of a historic building is a process that requires careful planning and execution, and the coordinated work of architects, engineers, code officials, contractors, and agency administrators. 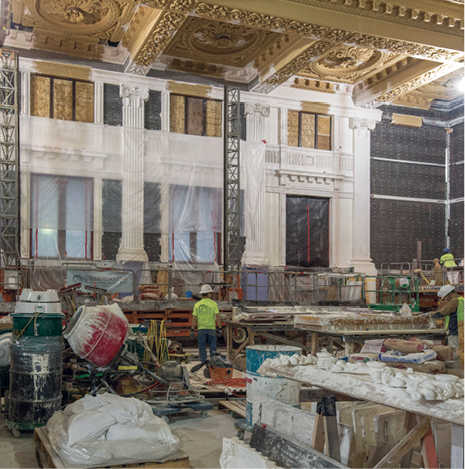 Project personnel working together can ensure that the architectural, structural, financial, programmatic, cultural, and social values of historic buildings are preserved, while rendering them safe for continued use. Figure 1. 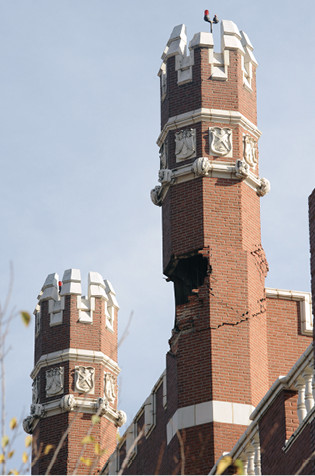 In 2011, a 5.6 magnitude earthquake substantially damaged all four turrets atop St. Gregory’s University Benedictine Hall in Shawnee, Oklahoma. Photo: St. Gregory University. Major repairs and alterations, additions, change in occupancy, and local ordinances can trigger compliance with current building code requirements, including seismic strengthening requirements that specify a minimum level of protection from earthquake hazards to building occupants. They also specify the process for the seismic evaluation of buildings, outline the methods for rehabilitation, specify limitations on selecting structural analysis procedures, identify acceptable rehabilitation strategies, and specify when alternative compliance methods may be used. Building codes are primarily intended to guide the design and construction of new buildings and often require the application of certain design and construction methods that are critical for good seismic performance. However, determining the seismic adequacy of historic buildings by comparing them to the requirements for new construction can be difficult, and sometimes impossible, because some archaic building materials and construction methods are not included in the new building codes. While many jurisdictions have adopted prescriptive standards, primarily for certain building types such as unreinforced masonry load bearing walls, more sophisticated, performance-based evaluation methods allowed by some codes offer more flexibility. Many prescriptive code complying standards can result in the destruction of much of a historic building’s appearance and integrity. This is because the most expedient way to reinforce a building is to introduce a completely new complying structural system, to add new structural members, and to fill in irregularities or large openings without regard to how the new structural elements or modifications affect its architectural design. The results of these approaches can be quite intrusive (Figures 2-3). However, structural reinforcement can be introduced sensitively while still meeting code requirements. In such cases, its design, placement, patterning, and detailing will respect the historic character of the building, even when the reinforcement itself is visible (Figures 4-5). Successful seismic rehabilitations of historic buildings require both skillful use of the best available technology as well a proper understanding of historic preservation, and the inherent strength of archaic materials and structural systems. The seismic retrofit of historic buildings is as much an art as it is a science; it is, therefore, extremely important to select a professional who is not only experienced with seismic rehabilitation of existing buildings, but is also closely familiar with The Secretary of the Interior’s Standards for the Treatment of Historic Properties. While some degree of change or alteration to a historic building may be inevitable and acceptable in a seismic rehabilitation, the Standards can provide critical decision-making guidance in the process of planning and designing a successful seismic rehabilitation. The goal of a successful seismic rehabilitation should be to reduce the seismic vulnerabilities of a building while retaining its historic materials and features to the greatest extent possible and avoiding or minimizing alterations to significant historic features and spaces. Figures 4 - 5. 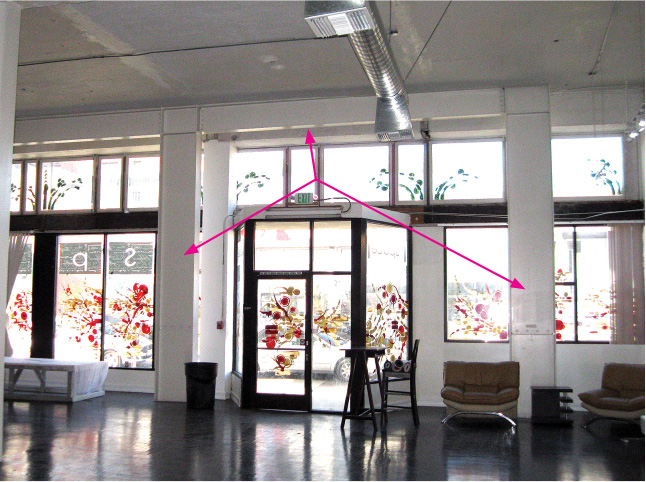 Using moment frames (horizontal and vertical steel members identified by the arrows) set back behind storefront openings as seen in Figure 4 (top), or placing brace frames (in red) away from the windows as illustrated in Figure 5 (bottom) are solutions that meet historic preservation goals. Figure 4. Photo: Elizabeth Hilton. Figures 2 - 3. 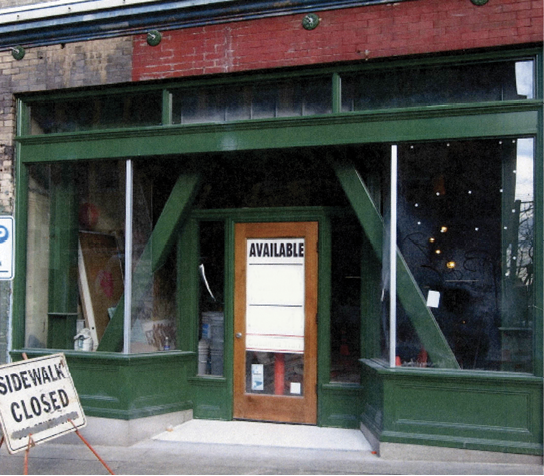 Standard approaches to seismic rehabilitation, such as adding diagonal bracing to reinforce window and storefront openings as seen in these photos, can be visually intrusive. Figure 2 (top). Figure 3 (bottom). Photo: Steade Craigo. Historic features and materials, both structural and nonstructural, should be preserved and retained, not as museum artifacts, but to continue to fulfill their historic function to the greatest extent possible, and not be replaced wholesale in the process of seismic strengthening. If historic features and materials are damaged beyond repair, or must be removed during the retrofit, they should be replaced in kind or with compatible substitute materials. If they must be removed during the retrofit, they should be removed carefully and thoroughly documented to ensure they can be properly re-installed in their original location. New seismic retrofit systems should work in concert with the inherent strengths of the historic structural system, and, whether hidden or exposed, should respect the character and integrity of the historic building, be visually unobtrusive and compatible in design, and be selected and designed with due consideration to limiting the damage to historic features and materials during installation. Seismic work should be reversible whenever feasible to allow its removal for future installation of improved systems as well as repair of historic features and materials. Figure 6. Failing nonstructural elements such as the stone-veneer window and door surrounds shown in this image can become a life-safety hazard when they block or impede an exit path. Photo: Wiss, Janney, Elstner and Associates, Inc. The Federal Emergency Management Agency (FEMA) defines seismic risk as a function of earthquake hazard and vulnerability. Assessing the seismic risk of a historic property is the first step to avoid the potential loss of life and injuries, damage and loss of property, or disruption of services. Seismic evaluations of historic buildings within areas of earthquake hazard should be conducted if they have not been previously performed. This evaluation should identify both the potential structural deficiencies of the building (any structural component such as columns, beams, floors, etc., required to resist seismic forces), as well as the potential vulnerabilities of the nonstructural components of the building (all components that are not part of the structural system, which include exterior cladding, glazing, chimneys, interior partitions, ceilings, and other architectural features, as well as building systems, and equipment). Nonstructural failures generally account for the majority of earthquake damage repair costs during earthquakes. Thus, it is critical to consider the risk and consequences of potential nonstructural failures. This is particularly important for historic buildings located in areas of low or moderate earthquake hazard, where the danger of collapse may be relatively small, but nonstructural elements such as unanchored stone veneers, cornices, parapets, chimneys, and gable ends may dislodge and fall to the ground during a moderate earthquake and pose severe life-safety hazards (Figure 6). Other important nonstructural hazards to consider are the possibility that gas and water lines may rupture during an earthquake, which can cause fire and water damage. Many of these vulnerabilities can be mitigated by understanding how the forces unleashed in an earthquake affect a building, and then planning and implementing appropriate remedial treatments (Figure 7). A team that is experienced with both seismic retrofit requirements and historic preservation, and can adopt an inter-disciplinary approach, is important for achieving a seismic rehabilitation that is sensitive to the building’s historic character, features, and materials. Team members should be selected for their experience with similar projects, and may include architects, engineers, code specialists, contractors, and preservation consultants. Because the typical seismic codes are written for new construction, it is important that both the architect and structural engineer be knowledgeable about historic buildings and about meeting building code equivalencies and finding other options. Local and state building officials can identify regulatory requirements, alternative approaches to meeting these requirements, and a historic preservation or building conservation code if one has been adopted by the jurisdiction. Even on small projects that cannot support a full professional team, consultants should be familiar with historic preservation goals. The State Historic Preservation Office (SHPO) and the local historic preservation office or commission may be able to identify consultants with experience in seismic rehabilitation of historic buildings, or be able to provide initial technical assistance on how to approach a seismic retrofit. Figure 7. 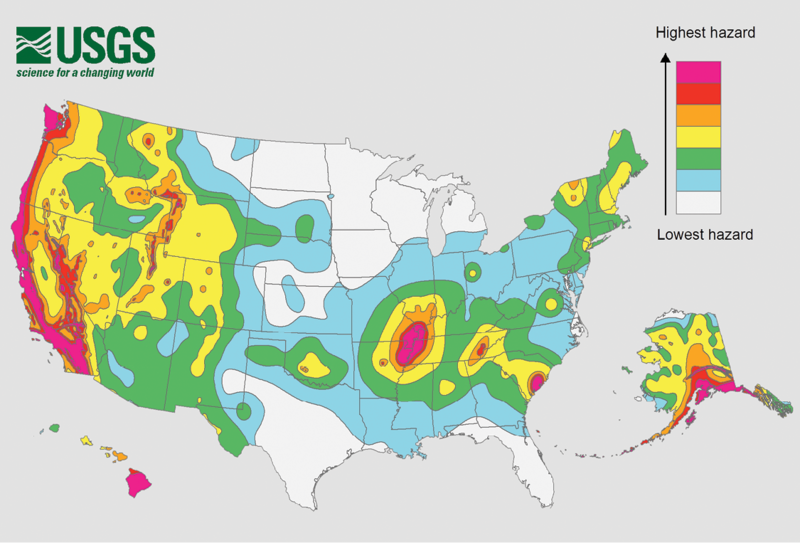 A simplified 2014 United States Geological Survey (USGS) seismic hazard map. Owners of certain classes of high-risk buildings in regions of high seismic activity are advised, and often required by local ordinances, to take immediate action in undertaking a comprehensive vulnerability assessment and make any necessary seismic rehabilitation measures. Owners of buildings in moderate seismic zones are advised to do further investigation of their building’s exposure to earthquake risk, identify seismic rehabilitation needs, and consider mitigation of risks primarily due to nonstructural hazards. Owners of buildings in low seismic areas are advised to consider low-cost rehabilitation measures that protect against casualties and property loss, if such measures are found to be necessary, even though the potential occurrence of an earthquake might be low. Figure 8. 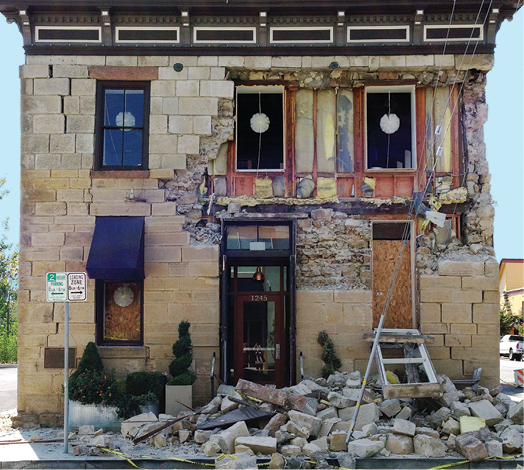 Unreinforced masonry buildings, such as this 1875 stone building damaged during the 2014 South Napa, California earthquake, can be particularly vulnerable to earthquake damage. Photo: Architectural Resources Group. Type of Building Construction. To a great extent, a historic building’s construction and materials determine its behavior during an earthquake. Some buildings, such as a broad class of wood-frame structures, are able to absorb substantial movements with little risk of collapse. Others, such as unreinforced masonry or adobe buildings, tend to be more susceptible to damage from shaking (Figure 8). If an earthquake is strong, or continues for a long time, building elements that are poorly attached or unreinforced may collapse or dislodge. Buildings of more rigid or stronger construction methods such as reinforced concrete or steel-frame buildings may also have seismic deficiencies depending on when they were constructed and whether or not they have been well-maintained over time. A thorough assessment of the building’s existing conditions is the basis for any seismic rehabilitation. This begins by gathering any available information about the building’s original construction. Many historic buildings in earthquake zones have survived episodes of ground shaking and may even have undergone previous seismic reinforcement work. Compiling any available documentation that quantifies their proven seismic resistance or describes seismic reinforcement work or any other changes that have occurred over time is extremely useful. Some of these records may have been already compiled in previous documentation assembled to nominate the structure to the National Register of Historic Places or for a Historic Structure Report. (If not previously done, for many buildings preparing a Historic Structure Report is highly recommended; see Preservation Brief 43: The Preparation and Use of Historic Structure Reports). Early real estate or insurance maps, such as Sanborn Maps, and assessor’s records may also note building changes over time. Original construction documents, plans and specifications, when available, and engineering drawings, in particular, which include structural layout and connection details are especially useful. When drawings documenting improvements or alterations over time are not available, building permits can also provide useful information. Historic photographs of the building under construction or before and after previous earthquakes are also invaluable. The compiled information, along with a thorough evaluation of the condition and strength of the existing building materials, will provide a sound basis for calculating the potential seismic hazards of the building and preparing a seismic retrofit plan. Figure 9. This image shows structural deformation due to stress concentration in structures with re-entrant corners, the inside corner where the two perpendicular exterior walls meet. Building Configuration. The geometry and shape of a building also play a role in how a building behaves during an earthquake. Buildings with regular plans, whether they are round, square, or rectangular, have a greater resistance to damage during an earthquake because their geometry allows for equal resistance of lateral forces in all directions. Buildings with complex and irregular plans, however, may be more prone to damage during an earthquake because of uneven strength and stiffness. For example, structures with an L,T, H, or other plan configurations with inward-facing, or re-entrant corners, have unequal resistance to stress concentrated at those corners and intersections (Figure 9). This is of particular concern if the buildings have flexible structural systems and/or have an irregular layout of shear walls, which may cause portions of the building to pull apart. Similarly, the more complex and irregular buildings are in elevation, the more susceptible they are to damage, especially tall structures. Other building features such as large ground-level storefront or garage openings, or floors with columns and walls running in only one direction, are commonly known as “soft” or “weak” stories, which increase the seismic vulnerability of historic buildings (Figures 10 and 11). Figures 10 - 11. Figure 10 (top): open first floor. 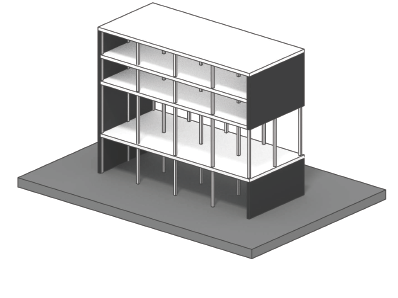 Figure 11 (bottom): double height second floor. These renderings show examples of “weak” or ”soft” story irregularities. Building Condition. Damaged and deteriorated building materials increase the risk of serious damage during an earthquake. This condition can be the result of poor quality workmanship and materials from when the building was built, or lack of proper maintenance. Material damage and degradation due to moisture, erosion, mold, or insect infestation are typical problems resulting from poor maintenance. Well-maintained buildings, even without added reinforcement, survive better than similar buildings that have not been maintained. In unreinforced masonry buildings, deteriorated mortar joints can weaken entire walls. Regular cyclical maintenance is therefore essential. The capacity of the structural system to resist earthquakes may also be severely reduced if previous alterations or earthquakes have weakened structural connections. Unrepaired cracks or damage from previous earthquakes can progressively weaken a building, increasing the potential for greater damage during the next earthquake. Cumulative earthquake damage can be significant; therefore, it is important to analyze the structural capacity of the building. Over time, structural members can become loose and pose a major liability. Unreinforced masonry buildings typically have a friction-fit connection between horizontal and vertical structural members, and the shaking caused by an earthquake pulls them apart. Insufficient bearing surfaces for beams, joists, and rafters against the load-bearing walls or support columns is another important factor to consider. The resulting structural inadequacy can cause a partial or complete building collapse, depending on the severity of the earthquake and the internal wall configuration. Evaluation of the general physical condition of the building’s interior and exterior, and identification of areas vulnerable to seismic damage, often requires testing and analysis to determine the durability and strength of materials and structure. This should be performed by a qualified engineer who is knowledgeable of historic materials and construction methods. In order to evaluate the actual strength and condition of the historic materials, selective destructive testing may be required. Site Seismic Hazards. In addition to the shaking motion of the ground during an earthquake, there is risk of damage due to site-specific hazards, such as fault rupture; liquefaction and other soil failures; landslides; hazards from adjacent buildings, including pounding; or potential inundation from nearby dam failure or a tsunami. If such hazards exist, they should be addressed along with any needed seismic rehabilitation of the building. Occupancy and Use. A building’s occupancy and use have a direct relationship to its seismic risk, as well as the social, economic, or environmental consequences that an earthquake may pose. From a life-safety perspective, warehouses, barns, and certain industrial buildings and structures with low human occupancy may present a lower risk compared to high-rise office buildings, theaters, and other high-occupancy buildings. Specific uses such as medical facilities, housing for persons of limited mobility, or buildings that support vital community services or utilities fall within use categories where the risk of damage or collapse during an earthquake requires special consideration. Owners of historic buildings that are being repurposed for a new use should be aware that, depending on the change, the new use may pose a higher risk to life safety and may require significant seismic reinforcement to mitigate its seismic risk. Inversely, if the change in use lowers the risk to life safety, the need for extensive seismic retrofit work may not be necessary. Regular maintenance ensures that existing historic materials remain in good condition and are not weakened by rot, rust, decay, or other moisture problems. Without exception, historic buildings should be well maintained. An evacuation plan should also be developed. With the knowledge that an earthquake may occur at any time in the future, building owners should have emergency information and supplies on hand. Check roofs, gutters, and foundations for moisture problems, and check for corrosion of metal ties at parapets and chimneys. Make repairs and keep metal painted and in good condition. Inspect and keep termite and wood-boring insects away from wooden structural members. Check exit steps and porches to ensure that they are tightly connected and will not collapse during an emergency exit. Check masonry for deteriorating mortar, and never defer repairs. Repoint, matching the historic mortar in composition and detailing. Contact utility companies for information on flexible connectors for gas and water lines and earthquake-activated gas shut-off valves. Strap oil tanks down and anchor water heaters to wall framing. Collect local emergency material for reference and implement simple household or office mitigation measures, such as installing latches to keep cabinets from flying open or braces to attach tall bookcases to walls. Keep drinking water, tarpaulins, and other emergency supplies on hand. Figure 12. A mezzanine was added to the original banking hall of this 1921 former bank building as a seismic strengthening measure. Subdividing such an important character-defining space can result in a severe loss to a building’s historic integrity. Just as important as the assessment of the material and structural condition of a building is the careful identification of the interior and exterior features and components that help define its historic character. Establishing a protection and preservation plan that identifies significant interior spaces, features, and finishes is essential. Significant architectural elements include domes and atriums and important or highly-decorative features such as staircases, ornate ceilings, mosaics, murals, and other historic treatments. Conversely, it is also important to identify secondary or tertiary areas of the building, or any spaces, features, or finishes that have been changed over time and no longer have historic significance. Less important spaces may provide areas for additional structural reinforcement to be installed during a seismic rehabilitation without having an adverse impact on the overall historic character of the building. Figures 13 - 15. 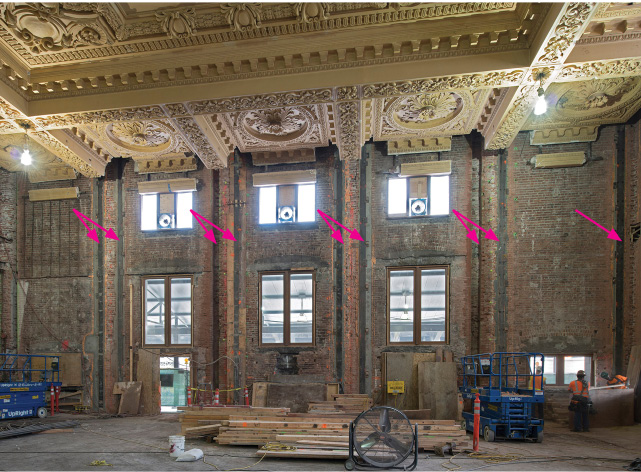 Vertical steel reinforcement members were inserted and grouted into the walls of the main waiting room in Seattle’s historic 1906 King Street Railroad Station to strengthen them (top). To replace the original plaster ornamentation, molds were made to cast new replacement plaster elements as shown on this work-in-progress photo (middle). Photos: John Stamets. 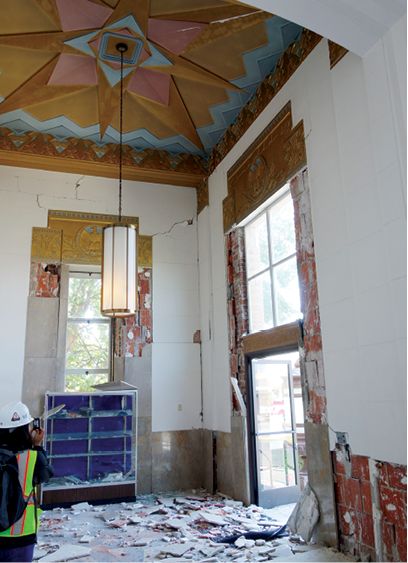 After completion of the seismic reinforcement, the replicated plaster ornamentation was installed and the decorative painted finishes restored, returning the waiting room of King Street Station to its historic appearance (bottom). Photo: Doug Scott. Performance Objectives. Once the risks and vulnerabilities of a building have been assessed, the next step in the process is usually setting goals for reducing the seismic risks. Knowing what rehabilitation requirements are mandated by the local jurisdiction is critical, as well as knowing whether a locality has separate codes for historic structures. There may be other triggers, such as a lender requiring retrofit or earthquake insurance when refinancing a loan, or a change of occupancy. The owner should also be aware of the different levels of seismic risk-reduction measures that can be chosen and their associated cost. Alternative ways of reducing seismic risk to life and property, such as reducing the occupancy of a building or providing alternative facilities in case of an earthquake, should be studied. After all alternatives have been considered, modification options for reducing the risk of damage to a historic building should be evaluated. Before undertaking a seismic rehabilitation, objectives that define the level of acceptable damage or loss for a building during a potential earthquake must be determined. These are referred to as “rehabilitation objectives.” The rehabilitation objectives are usually set by the local code, ordinance, or code official in mandatory seismic strengthening programs, or chosen by the owner and engineer in a voluntary seismic rehabilitation (see ASCE Standard 41-13). Figure 16. Computer modelling is a useful analytic tool that helps assess the strengths and weaknesses of a building and evaluate different seismic strengthening options. Three-dimensional dynamic analysis is required for a number of different structures located in certain seismic zones. Photo: Wiss, Janney, Elstner and Associates, Inc. Operational. Backup utility services maintain function; the building sustains very little damage. This approach is intended for critical facilities, such as hospitals and emergency management centers, which must remain open and operational after a major earthquake. For some historic buildings, achieving this level of performance may be difficult or next to impossible without a great deal of modification. However, as more buildings that were engineered to sustain ground-shaking become historic, more may achieve this level of performance. Immediate Occupancy. The building remains safe to occupy. Damage and expected repairs are minor. Life Safety. The building remains stable and has substantial structural reserve capacity; hazardous nonstructural damage is controlled. Collapse Prevention. This addresses the most serious life-safety concerns by correcting those deficiencies that could lead to serious human injury or total building collapse. The building remains standing in order for occupants to exit the building; any other damage or loss is acceptable. It is expected that if an earthquake were to occur, the building should not collapse but would be seriously damaged, could not be occupied, and would require major repairs or need to be demolished. Figures 17 - 18. Careful placement of the new structural reinforcement, painted to match the surrounding building elements, if left exposed, minimizes its visual impact. New added structural elements may be left exposed when their visibility does not impair the historic character of the building. Figure 17 (top). Photo: Jason Hagin. Figure 18 (bottom). Photo: Architectural Resources Group. From a design perspective, the vast majority of historic buildings can tolerate a well-planned and placed system of seismic reinforcement. Utilitarian structures, such as warehouses, may be able to receive fairly visible reinforcement systems without undue damage to their historic character (Figures 17-18). Other, more architecturally detailed buildings or those with more finished or decorative interior surfaces will benefit from more hidden systems. However, installation of such systems may require the temporary removal and reinstallation of significant features as part of the seismic rehabilitation work. Most buildings can incorporate seismic hazard mitigation during other construction work in a way that ensures a high degree of in-place retention of historic materials. Building performance levels are established for both structural and nonstructural damage. While reducing life-safety risks and ensuring safe post-earthquake occupancy of a building might be the primary concerns for many owners, potential damage to contents may be extremely important in certain circumstances. Important archives and records, invaluable art objects, and book and other collections are often housed in historic buildings. Risk-reduction measures associated with hazardous materials or valuable equipment must also be considered. Nonstructural components are all those elements other than the columns, bearing walls, floors, beams or trusses, bracing elements, foundation, and other elements that make up a building’s structure (Figures 19-20). In the past, seismic rehabilitation of existing buildings has focused on mitigating structural deficiencies. 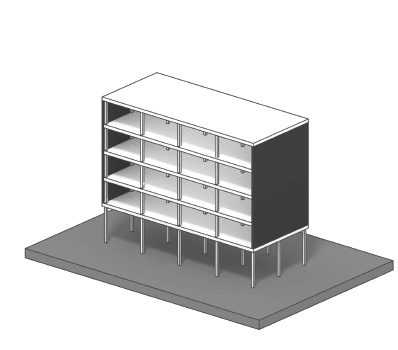 However, nonstructural components represent a substantial portion of a building’s initial capital investment; and, based on post-earthquake surveys, losses from nonstructural components also represent a high percentage of losses during an earthquake (see FEMA E-74: Reducing the Risk of Nonstructural Earthquake Damage—A Practical Guide). Figure 19. 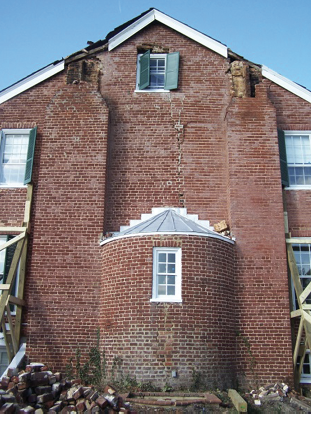 Chimneys are common nonstructural features susceptible to earthquake damage, even in zones of low-to medium-seismic activity as shown on this building in Virginia damaged in a 2011 earthquake. Photo: Suzanne Tripp. Life Safety. Could anyone be hurt by this component in an earthquake? Property Loss. Could a large property loss result? Functional Loss. Could the loss of this component cause an outage or interruption in operations? Figure 20. Bracing parapet walls, as illustrated in the typical detail drawing (top) and as installed in the image (bottom), helps avoid hazards from falling debris. Designing a successful seismic rehabilitation takes into consideration not only seismic performance and historic preservation concerns, but financial ones as well. The rehabilitation of historic buildings often triggers mandated seismic strengthening work to comply with local codes. This often occurs when the amount of work crosses a certain threshold or when the rehabilitation involves a change in use, such as the conversion of an industrial building into a residential use. In these cases, the rehabilitation includes all the work necessary to meet the new programmatic requirements as well as the seismic performance objectives in a “single-stage” project. All the costs and occupancy disruptions are also incurred at one time, and a significant upfront capital investment is required. When budgetary constraints and/or occupancy restrictions do not make a single-stage project feasible, a “multi-stage” project that spreads the cost and occupancy disruptions over a set period of time should be considered. The term used for a planned rehabilitation, implemented over a period of time to meet a predetermined seismic performance objective, is an “incremental rehabilitation.” In an incremental rehabilitation, the work is integrated into ongoing facility maintenance and capital improvement operations. An incremental approach has been shown to have many advantages from a benefit/cost analysis (see FEMA 227, 395, and 399). Whether the seismic rehabilitation will be done as a single project or incrementally, construction documents must be prepared. The documents should clearly define the overall scope of the work. In the case of an incremental rehabilitation, the scope and sequence of each phase must also be clearly detailed. A good set of construction documents along with a quality assurance program to ensure that the design is carried out as specified is critical for any successful seismic rehabilitation. It is also critical that the construction documents include details and specifications for the treatment of historic features and materials. Selecting a contractor with a proven record of successful historic rehabilitation work is extremely important. It is also recommended that the project team schedule a meeting with the local building code official to discuss the seismic retrofit approach and to explore potential code compliance alternatives. These questions should be discussed with the team to determine acceptable alternatives. Since there is never a single “right” answer, the design team and code officials should work together to determine the appropriate level of seismic retrofit with the lowest visual impact on significant spaces, features, and finishes on both the interior and exterior of historic buildings. 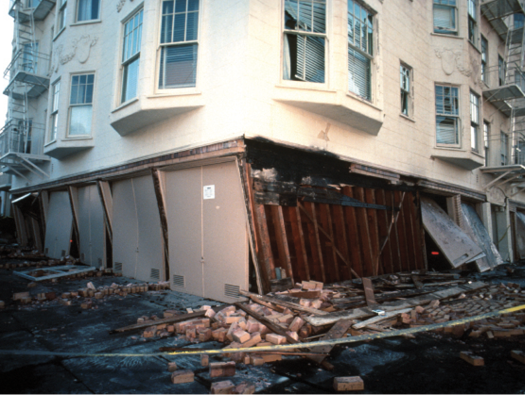 This guide is not intended to prescribe how seismic retrofit should be done, but rather, to illustrate that every physical change to a building will have some consequence. By asking how impacts can be reduced, the owner will have several options from which to choose. 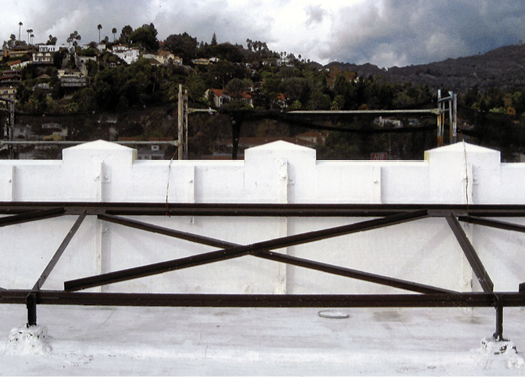 Can bracing be installed without damaging decorative details or the appearance of parapets, chimneys, or balconies? Are the visible features of the reinforcement, such as anchor plates/washers or added exterior buttresses adequately designed to blend in with the historic building? Can hidden or grouted bolts be used to tie floors and walls together, instead of using traditional bolts and exposed washers or rosettes if they might detract from a building’s historic character? Are diagonal frames, such as X- or K-braces or other located to have a minimal impact on the primary facade? Are they set back and painted a receding color if visible through windows or storefronts? Can moment frames or reinforced bracing be added around historic storefronts in order to avoid exposed reinforcement, such as X-braces, within the immediate viewing range of the public? 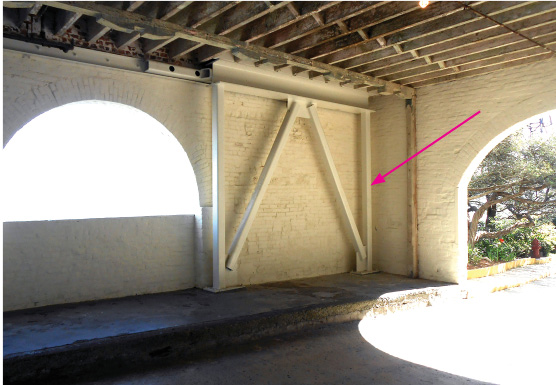 Can shorter sections of reinforcement be “stitched” into the existing building to avoid removing or covering large sections of historic materials? This is particularly important for the insertion of additional roof framing supports. Can shear walls be located in utilitarian interior spaces to reduce the impact on finishes in the primary areas? Are there situations where a thinner, applied fiber-reinforced coating would adequately strengthen walls or supports without the need for heavier reinforced concrete? Can diaphragms be added to non-significant floors in order to protect highly decorated ceilings below, or the reverse if the floor is more ornamental than the ceiling? Are there adequate funds to retain, repair, or reinstall ornamental features and finishes once structural reinforcements have been installed? Should alternative seismic reinforcement methods such as base isolation, wall damping systems, or core drilling be considered? Could they protect significant features and materials by reducing the amount of intervention required? Are the seismic treatments under consideration “reversible” in a way that allows the most amount of historic materials to be retained and allows future repair and restoration? Could the seismic rehabilitation add excessive strengthening that could have unintended negative consequences to the historic structure during an earthquake? Figure 21. 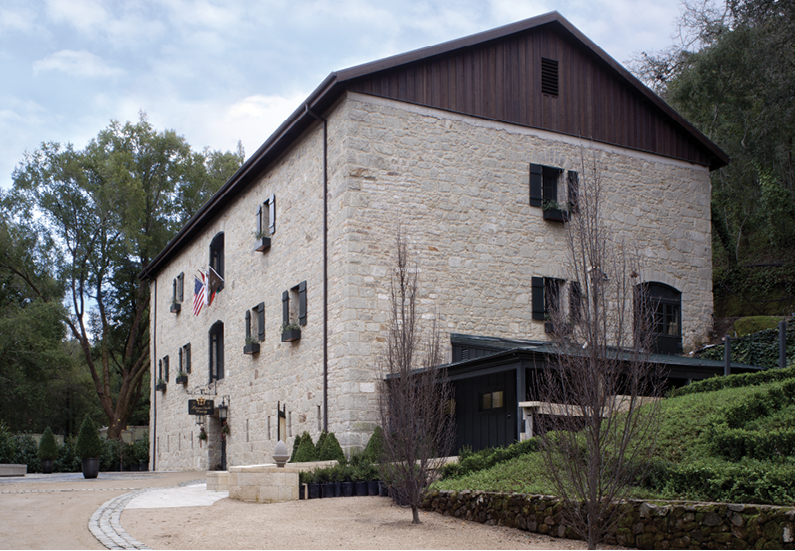 Historic wine cellar building in Napa, California. Achieving desired building performance objectives depends on the specific occupant needs, site, and building conditions. The particular approaches to achieving this should also be tailored to the unique historic character and conditions of each building, and the specific seismic deficiencies that need to be remedied or mitigated. Most seismic deficiencies and possible required mitigation techniques can be divided into the general categories described here. Although not an exhaustive list, it is intended to provide an overview of the scope of work a building owner or project manager might expect during a seismic rehabilitation. Inadequate Global Strength or Stiffness. Historic buildings which were not designed to resist the lateral forces of a ground-shaking event often lack adequate overall strength, or “global strength.” While this is seldom the only deficiency that needs to be mitigated, lack of sufficient global strength makes a building particularly vulnerable during a seismic event. Figure 22. 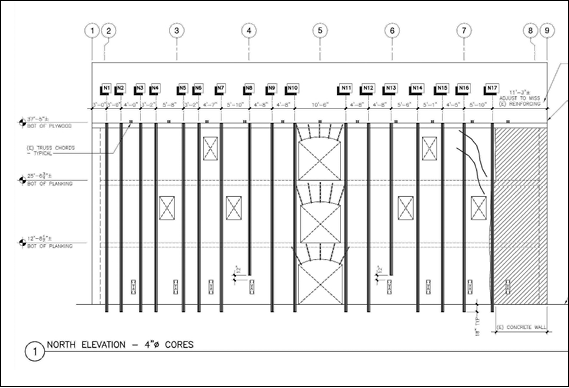 Drawing of the wine cellar’s front wall showing the locations of the center cores for continuous steel reinforcement rods to be inserted and grouted in place. Approaches to mitigating this deficiency often require reinforcing the existing structure or adding structural components to strengthen the building. Mitigating the lack of sufficient overall stiffness, or “global stiffness,” is also necessary in many seismic rehabilitations. While the methods used to improve stiffness are often the same as those used to correct inadequate strength, strength and stiffness are considered separately because they relate to specific building responses. A building may have minimum acceptable strength to prevent its collapse, but if it is too flexible the building may be vulnerable to excessive movement or drift. Too much drift often results in extensive damage to exterior and interior walls and nonstructural components. The addition of steel moment frames, braced frames of various configurations, and concrete shear walls are typical methods for increasing the strength and stiffness of a building. Careful placement of new structural elements is critical to avoid negatively affecting windows and doorways, particularly on highly-visible elevations. Alterations to significant interior spaces such as lobbies, assembly spaces, and other character-defining spaces should likewise be avoided. Figures 23 - 24. View of one of the center cores drilled down through the wall (top). Eye bolts are used to anchor the floor to the wall (bottom). Building Irregularities. Plan irregularities such as re-entrant corners place extraordinary demands on building elements due to torsional or twisting reactions to the ground-shaking forces of an earthquake. Vertical irregularities create an uneven distribution of the mass or stiffness between the vertical elements of the building which can be particularly problematic in multi-story buildings. The vulnerability to seismic damage that these types of irregularities impose was seldom considered in the original design of many historic buildings, and normally requires retrofit measures to mitigate them. Plan and elevation irregularities are too many to enumerate here. Mitigation measures for this type of deficiency can be challenging to undertake in historic buildings, as some of these irregularities may be important to the building’s historic character. Some of the most problematic solutions involve adding shear walls directly behind window and door openings, particularly when they are on highly-visible elevations. Solutions that involve inserting a new floor or a large mezzanine into an architecturally significant, two-story space should be avoided. Load Path. There should be a positive and continuous load path to convey lateral forces. Inadequate connection between structural and nonstructural components of a building is one of the most critical deficiencies to be addressed in many seismic rehabilitations. Forces acting on building components must be able to be transferred down to the supporting soil. For example, in order to resist the forces of an earthquake, a panel of cladding must be adequately connected to the floor, walls, frames, braces, and other structural members that connect it to the building’s foundation. A strong connection between all of the elements of the building allows for the transfer of the stressing forces down to the foundation, where it is absorbed by the soil. Breaks or failures along this load path render any existing seismic system ineffective. Methods for mitigating load path deficiencies range from simple reinforcement measures such as adding metal straps, threaded bolts, and other mechanical fasteners to more elaborate engineered connections. Adequate connections between walls, roof, floors, and foundation are critical, as well as between the components of all the vertical and horizontal structural components of the building such as joist to beams or walls, and columns to beams and floors or footings. Figure 25. 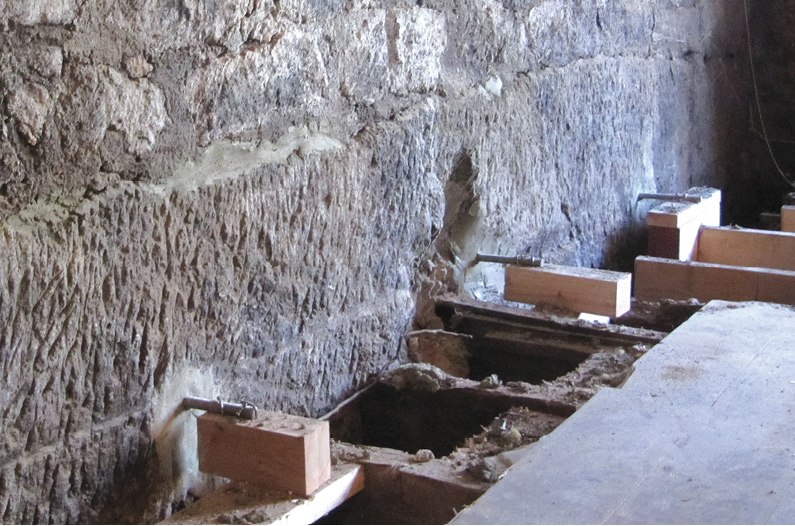 Location of the eye bolts after grouting The seismic rehabilitation of this historic wine cellar building shown in Figure 21 included center coring of the exterior stone walls to add steel reinforcement, as illustrated in Figures 22 and 23. 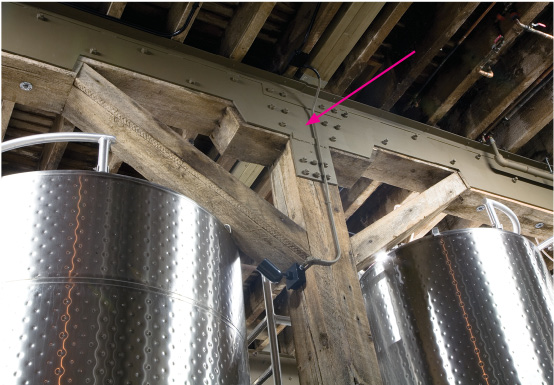 The floors were tied to the steel reinforcement in the walls using eye bolts, as seen in Figures 24 and 25, eliminating the need for exterior washers or plates. Figure 21. Photo: Architectural Resources Group. Photos: MKM & Associates. Diaphragms. Floors and roofs are commonly referred to as “diaphragms” in seismic design. Diaphragms act as horizontal “beams” between the vertical elements (walls and/or columns) that resist the lateral forces during an earthquake. Inadequate shear, bending strength, and stiffness are some of the most common diaphragm deficiencies. Strengthening methods for diaphragms can entail adding sheathing to roofs or floors, installing tension rods in shallow-vaulted concrete floors, and various other methods. Reinforcement around openings, re-entrant corners, and mitigation of other plan irregularities may also be necessary. Ensuring proper transfer of the lateral earthquake forces spread over the diaphragm to the lateral force-resisting system (vertical elements of the structure) is also an important component of a seismic retrofit. Adequate diaphragm “collectors,” structural elements that collect the lateral force and transfer it to the lateral force-resisting system, need to be strengthened or added to compensate for any deficiencies in the existing construction. Foundations. Foundation deficiencies can vary greatly and include deficiencies within the foundation system itself or with the soil conditions. Foundation deficiencies are independent of building or construction type, and remedial work can include replacing or upgrading the existing foundation, adding a new foundation next to the existing one, or adding new pilings or drilled piers. 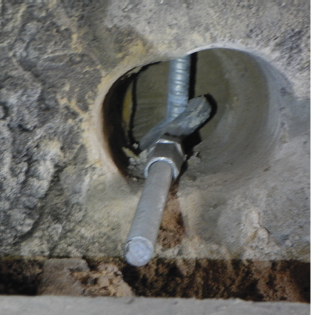 While often expensive and disruptive to correct or mitigate, foundation deficiencies are critical to address. Figure 26. Epoxy-embedded fiberglass mesh is being bonded to the back of the brick pilasters of this 1906 unreinforced masonry building. New finishes matching the appearance and detailing of the original finishes will be applied over the mesh. Photo: Wiss, Janney, Elstner and Associates, Inc.
Unreinforced Masonry Bearing Wall. Unreinforced masonry (URM) buildings are most commonly brick or stone without steel reinforcement bars imbedded in them. In many historic buildings of this type, masonry bearing walls support the weight of the roof and floors. Joists bear directly on the wall at the perimeter of the building and are supported by post and beams on the interior. Unreinforced masonry is one of the oldest and most diverse construction types and encompasses a wide range of materials and wall construction methods such as solid clay brick, cut or field stone, hollow-clay brick, structural tile, concrete masonry units, and adobe. URM buildings are generally considered to be some of the most susceptible to earthquake damage. In strong earthquakes, the walls may fall outward and cause a partial or total collapse of the building. 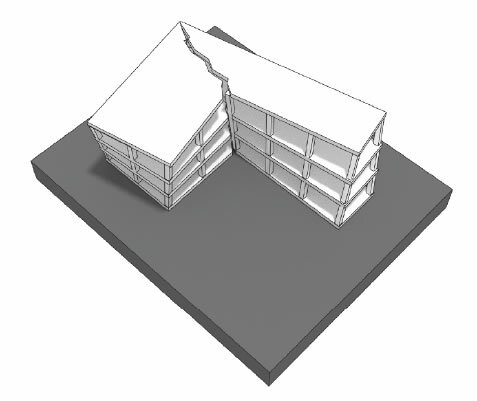 Poor connection between the exterior walls and diaphragms severely impair the capacity of a URM building to resist an earthquake, and thus it is important that this be remediated. Other significant hazards that can be life threatening are falling debris from parapets, cornices, chimneys, or other nonstructural elements. Figure 27. A new steel stud wall is being added to one side of this interior hollow-clay tile wall. The side with the least amount of historic finishes was chosen as the least disruptive location for the added reinforcement. The wall will be returned to its original appearance by installing new finishes matching the historic finishes. Photo: Wiss, Janney, Elstner and Associates, Inc.
A basic seismic rehabilitation program for a URM building may involve bracing the parapets and chimneys, and securing other elements that can break away from the building, as well as securing the walls to the floors and roof. Engineering analysis of the structure may indicate that additional reinforcement of the roof and floor may be necessary. This may be accomplished by adding columns or shear walls in order to adequately transfer lateral loads to the ground. 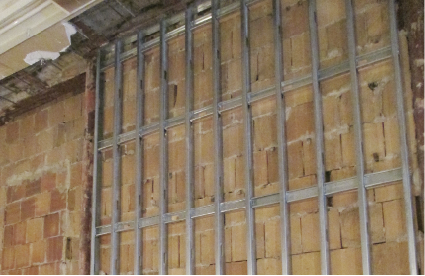 Preventing the collapse of the walls, particularly load-bearing walls, is critical in URM buildings. This entails strengthening the walls through various methods such as adding strongbacks, or secondary support members, to the wall; adding a layer of steel-reinforced concrete; adding shotcrete bonded to the URM wall; core drilling; or adding a fiber composite layer (epoxy embedded fiberglass mesh). Adding interior wall bracing or inserting vertical steel bars embedded in grout into the wall itself are also widely-used wall reinforcement methods. These techniques must be carefully evaluated to balance building performance and preservation objectives (Figures 21-27). Figure 28. Steel reinforcement for the new sheer walls, perpendicular to the windows, is being installed in this concrete-frame building. Photo: Robert Chattel. Concrete Frame. Most historic concrete building assemblies consist of concrete columns and floor systems of various types (flat slabs, two-way slabs, and beam-and-slab). Exterior and interior walls are often unreinforced masonry, commonly called infill, and are typically nonstructural, presenting the deficiencies described previously. The most important structural vulnerability of this construction type is the lack of ductility. Prior to 1960, building codes may not have required concrete-frame buildings to be designed and detailed for ductile performance (i.e., not fail when loaded beyond capacity) to resist lateral forces, depending on the region. Concrete-frame buildings were required to be “ductile” in the 1976 Uniform Building Code. In many historic concrete-frame buildings, because the connection between the columns and beams is not strong enough to resist the lateral loads during an earthquake, the buildings are in danger of collapsing. Particularly vulnerable buildings of this type are those with relatively few concrete walls and columns that are weaker than the beams or slabs. Mitigating this condition is typically accomplished by adding a new system, such as shear walls (Figure 28). Steel Frame. This type of construction consists of a complete frame of steel columns and beams. Floors are usually concrete slabs or metal decks filled with concrete. Exterior walls can be reinforced or unreinforced masonry, architectural terra cotta, glass curtain walls, or other types of construction. Mitigating the seismic deficiencies of the nonstructural elements must be done according to their construction methods. Steel-frame construction is used in a wide variety of building types such as offices, hospitals, government, and academic buildings, as well as industrial and other utilitarian structures. This type of construction started to gain widespread use in the latter part of the 19th century. There are two general categories of steel-frame construction: Steel moment frame, which consists of steel columns and beams with rigid connections using angles and plates that can be riveted, welded, or bolted together; and braced frame. Braced-frame structures have diagonal steel members placed in selected bays of the structure to improve the lateral force resistance of the overall structure, whereas moment frames rely on the strength of rigid corner connections to resist lateral forces. Steel-frame buildings, particularly braced-frame buildings, have superior seismic performance over other construction methods. Moment-frame buildings are very elastic during seismic activity, and, although they are able to withstand strong lateral forces, they are subject to significant movement between stories, or interstory drifts, and are also prone to pounding on adjacent buildings. Their flexibility can also result in damage to structural connections as well as to interior walls and cladding. Large interstory drifts may make steel-frame buildings more difficult to repair after an earthquake. Typical remedies to improve the stiffness of steel-frame buildings include adding new concrete shear walls or brace frames, or adding steel cover plates to the existing steel columns. The latter technique may not be recommended if it requires significant removal or damage to existing historic features or finishes. Light Wood Frame. Light wood-frame construction is common in much residential and small commercial building construction. It includes both post-and-beam construction as well as stud-wall construction. Life-safety performance of light wood-frame construction during an earthquake is typically very good. The most common seismic deficiency of this building type is the lack of, or poor, anchorage of the walls to the foundation, deterioration of existing structural fasteners, and/or an insufficient number of fastened connections. Inadequate strength of the lower stories in multi-story buildings may also be a vulnerability. In many dwellings this includes structures resting on intermittent wood or masonry piers, unfinished garages, and/or crawlspaces. Figure 29. Cripple-wall reinforcement. 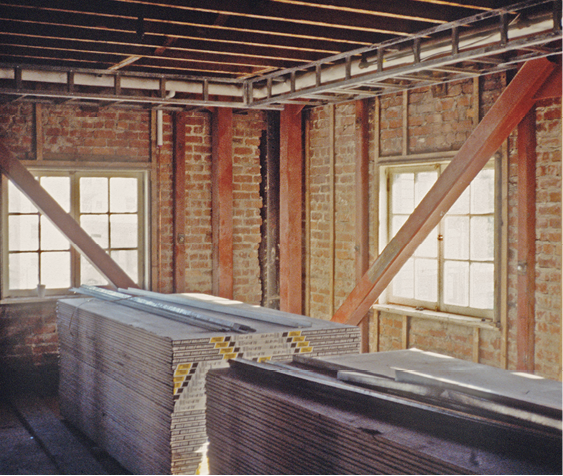 Simple approaches such as nailing plywood between crawlspace studs, bolting sill plates to the foundation, and strapping the cripple wall to the floor above can make a dramatic difference in protecting a building from seismic damage. Unbraced cripple walls and poor foundation anchorage are common vulnerabilities in many one-and two-family detached dwellings of one or more stories. In these buildings, interior walls usually provide sufficient bracing to resist lateral loads during a seismic event, but the crawlspace often only has perimeter framing which may become highly stressed and collapse during an earthquake. Adequate anchorage to the foundation in wood-frame dwellings prevents them from sliding off their foundation. Mitigating the lack of adequate bracing of cripple walls and proper foundation anchoring are high priority seismic rehabilitation measures in light wood-frame buildings (Figure 29). Multi-story, multi-unit residential wood-frame buildings with parking, common areas, or commercial uses on the ground floor are a sub-category of this construction type that is also very susceptible to damage during earthquakes. The upper floors of these buildings typically have a repetitive interior layout which gives them uniform strength and stiffness. The lower floors however, because they typically have larger exterior openings and may have more varied interior configurations and large open spaces, often create a “weak story” condition (Figure 30). Figure 30. 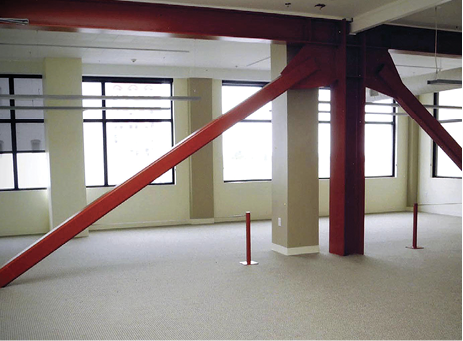 Large perimeter openings and a limited number of interior partitions on the ground floor can create a “weak story” condition that makes buildings particularly vulnerable to earthquake damage. Photo: USGS. Seismic rehabilitation requirements for one-and two-family residential and other small-scale buildings commonly include securing chimneys and correcting other life-safety nonstructural deficiencies, such as bolting the sill plate to the foundation and adding plywood sheathing to reinforce knee walls. Structures built over intermittent wood or masonry piers are also vulnerable during earthquakes. 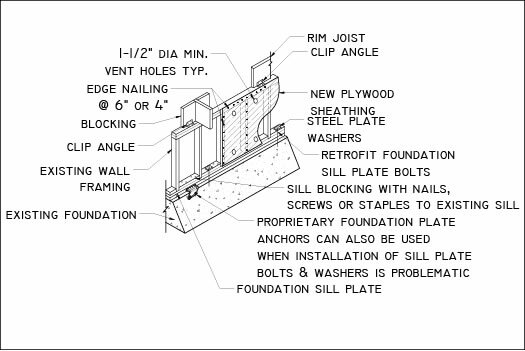 Providing connection between the piers or installing a new continuous support element of adequate strength under the walls is often required. Large exterior openings such as garage doors or structural irregularities such as cantilevers must also be evaluated and mitigated. 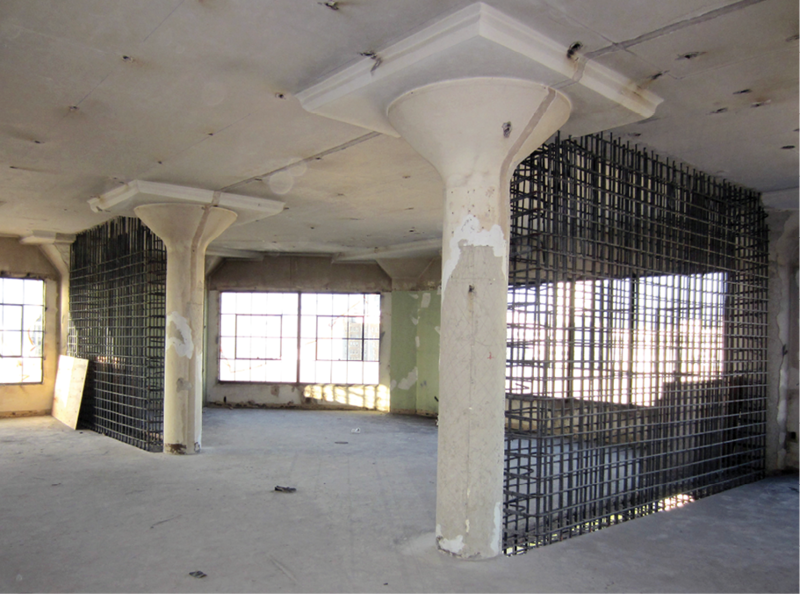 In the case of multi-story apartment buildings with a soft or weak story, additional steel frames or masonry shear walls may be necessary to give adequate strength to the ground floor (see FEMA P-807). Seismic isolation and energy dissipation systems are relatively new, highly sophisticated methods that require extensive design and engineering analysis. Seismic isolation systems involve disconnecting, or greatly reducing, the transmission of the seismic forces from the ground to the building. Energy dissipation methods involve either passive or active energy dissipation devices that dampen the effects of the lateral and vertical motion of an earthquake. Energy dissipation systems are sometimes used in tall buildings where installing seismic isolation systems may not be feasible. However, implementing either of these systems is often too costly or impractical for most seismic rehabilitations of historic buildings. 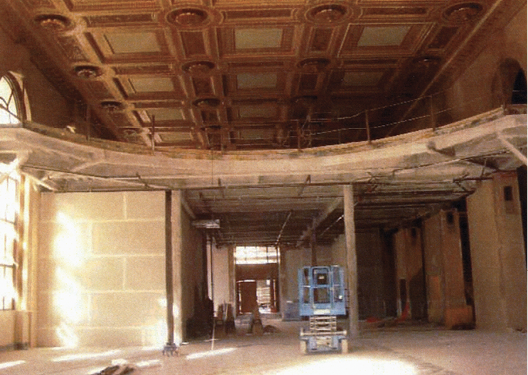 Reinforcing the connection between various structural and nonstructural elements, installing new structural elements, and performing other seismic rehabilitation work may require selective removal of historic wall and ceiling finishes. Attention should be given to minimize the amount of historic material removed, as well as performing the necessary repair or replacement of the historic features and finishes after the seismic work is completed. Completely removing a character-defining feature such as a chimney, cornice, or parapet in order to mitigate its seismic vulnerability is not a recommended treatment. Instead, such building elements should be braced and secured whenever possible. If a significant architectural feature has sustained earthquake damage, it should be repaired rather than removed. If the damage is so extensive that it requires complete replacement, using in-kind replacement materials is generally the recommended approach. In some circumstances, however, a compatible substitute material that meets technical performance requirements may be appropriate, such as a lighter weight material that matches the original in design and appearance. Historic corridor walls constructed of unreinforced masonry, hollow-clay tile in particular, need careful consideration. Every effort should be made to retain the historic materials while taking measures to secure the wall and the historic materials to prevent them from the possibility of injuring occupants or blocking an egress path. Every available reinforcement method and technique that allows the corridor walls and their historic materials and detailing to be preserved in place should be considered. 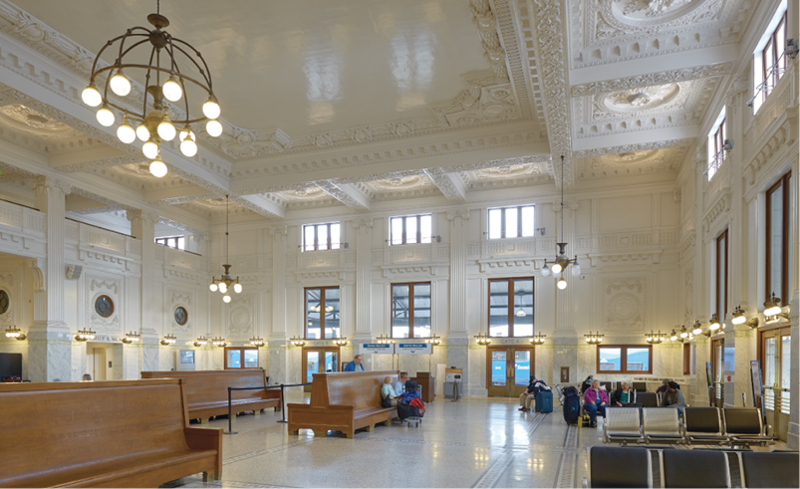 If retention of the core masonry elements is not feasible, but there are extant features and finishes, such as a marble wainscot, doors and transoms, wood trim, or other features, they should be retained, even if they have to be reinstalled over a new framing structure for the corridor that replicates the ceiling height, corridor width, and the relationship and installation details of the historic features. In most municipalities, a survey or inspection, usually by professionals or trained volunteers, will be conducted as soon as possible after an earthquake, and buildings will be tagged on the front with a posted notice stating whether they are safe to enter. Typically red, yellow, and green tags are used to indicate varying levels of damage—no entry, limited entry, and useable, respectively—and their relative safety. Heavily-damaged areas are often secured and determined off-limits, and, unfortunately, many red-tagged, but repairable, buildings have been torn down unnecessarily because owners were unable to evaluate and develop a stabilization plan in time. Owners or members of the preservation community may engage their own engineers with specialized knowledge to challenge a demolition order. During times of emergencies, many communities, banks, and insurance agencies will not be in a position to evaluate alternative approaches to dealing with damaged historic buildings. Therefore, they often require full compliance with codes for new construction for the major rehabilitation work required. Because seismic aftershocks may further damage a weakened building, the inability to act quickly—even to shore up or stabilize the structure on a temporary basis—can result in the building’s demolition. Penetrating rain, uneven settlement, vandalism, and continuing aftershocks can easily undermine a building’s remaining structural integrity. Moreover, the longer a building is unoccupied or non-income-producing, the sooner it is likely to be torn down in a negotiated settlement with the insurance company. All of these factors work against saving buildings damaged in earthquakes. Thus, having a recovery plan already in place is highly recommended. Having an established emergency plan, complete with access to plywood, tarpaulins, bracing timbers, and equipment, will allow quick action to save a building following an earthquake. Technical assistance programs are available from the federal government after a natural disaster. Grant funds or low-cost loans from federal, state, and Congressional special appropriations are targeted for qualified properties, which can help offset the cost of rehabilitation (see information about FEMA). Recognizing the seismic vulnerability of historic buildings is an important step toward saving and protecting the built heritage in earthquake-prone areas. Vulnerability resulting from lack of maintenance and improper repairs that weaken the structural integrity of a building must not be overlooked. Even prior mitigation work can become ineffective over time if buildings are not adequately maintained. Unlike many other natural disasters, earthquakes come with no warning and can result in devastating loss of life and property. Therefore, preparedness cannot be overemphasized. Damage to historic buildings after an earthquake can be as great as the initial damage from the earthquake itself. The ability to act quickly to shore up and stabilize a building and to begin its sensitive rehabilitation is imperative. Communities without earthquake-hazard-reduction plans in place put their historic buildings—as well as the safety and economic well-being of their communities—at risk. Simple measures such as bracing parapets and chimneys, tying buildings to foundations, and anchoring brick walls to floors and the roof, are extremely effective mitigation measures. However, even simple measures such as these can cause damage to historic materials or impact the visual qualities of a historic building when not properly executed. For this reason, engaging qualified and experienced professionals and workers when undertaking seismic retrofit work is important. Finally, modern research has helped develop various new seismic retrofit techniques that, added to more traditional methods, provide many approaches to strengthen buildings in earthquake-prone areas. These techniques must be carefully evaluated and chosen so that the process of mitigating potential seismic damage avoids unnecessary removal of historic materials and retains the character of historic properties. Base isolation: Also referred to as Seismic Base Isolation or Base Isolation System, is a technique aimed at isolating or separating a building or structure from the movement caused by earthquakes by means of a flexible layer between the foundation and the vertical supports. Braced Frame: Essentially, a vertical truss, or its equivalent, added to a building frame to resist lateral forces. Collector: A member or element provided to transfer lateral forces from a portion of a structure to vertical elements of the lateral force-resisting system (also called a drag strut). 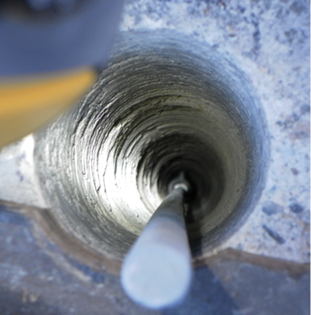 Core drilling: A vertical reinforcement system that relies on drilling a continuous vertical core that is filled with steel reinforcing rods and grouting to resist in-plane or out-of-plane bending. Cripple wall: A short wall between the foundation and the first-floor framing. Damping: The internal energy absorption characteristic of a structural system that acts to attenuate induced free vibration. Diagonal braces: Inclined components designed to carry axial loads, enabling a structural frame to act as a truss to resist lateral forces. Diaphragm: A horizontal, or nearly horizontal, system designed to transmit lateral forces to the vertical elements of the lateral force-resisting system. The term “diaphragm” includes horizontal bracing systems. Fiber wrap reinforcement: A synthetic compound of filaments that increase the shear capacity of structural members. Ductility: The ability of a structure or element to dissipate energy inelastically when displaced beyond its elastic limit without a significant loss in load-carrying capacity. Fault rupture: A break in the ground along the fault line during an earthquake. Global strength: The lateral strength of the vertical oriented lateral force-resisting system at the effective global yield point. Global stiffness: The stiffness of the entire lateral force-resisting system. Grouted bolts: Anchor bolts set in a grout mixture. Interstory drift: The displacement of one floor level relative to the floor level above or below. Lateral force-resisting system: The part of the structural system assigned to resist lateral forces. Liquefaction: A condition where the soil underneath or around the building loses cohesive strength and behaves like a liquid during an earthquake. Life safety: Providing a level of assurance that risk of loss of life is kept to minimal levels. For buildings, this includes strengthening to reduce l) structural collapse, 2) falling debris, 3) blocking exits or emergency routes, and 4) prevention of consequential fire. Moment frame: A structural frame system in which seismic shear forces are resisted by shear and flexure in members and joints of the frame. Pounding: The action of two adjacent buildings coming into contact with each other during an earthquake as a result of their close proximity and differences in dynamic response characteristics. Re-entrant corner: A corner on the exterior of a building that is directed inward such as the inside corner of an L-shaped building, where the two perpendicular portions of the building meet. Seismic rehabilitation: Modifications to existing components, or installation of new components, that correct deficiencies identified in a seismic evaluation to achieve a selected rehabilitation objective. 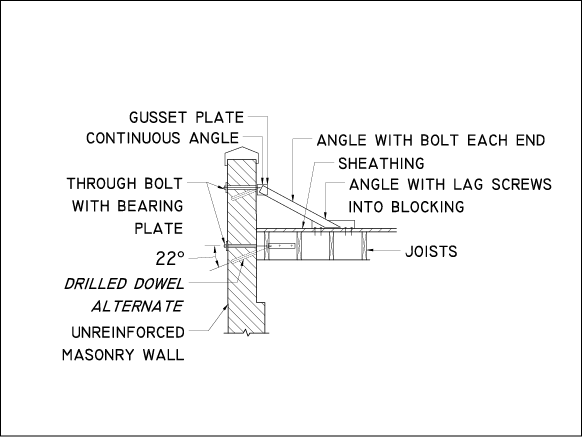 Shear wall: A wall, bearing or nonbearing, designed to resist lateral forces acting in the plane of the wall. Shotcrete: Concrete that is pneumatically placed on vertical or near vertical surfaces, typically with a minimal use of forms. Soft story: A story in which the lateral stiffness is less than 70 percent of the stiffness of the story above. Structure: An assemblage of framing members designed to support gravity loads and resist lateral forces. Structures may be categorized as building structures or non-building structures. Weak story: A story in which the lateral strength is less than 80 percent of that in the story above. In March 2003, FEMA and 22 other federal agencies, programs and offices became part of the Department of Homeland Security. FEMA’s role and mission continues to focus on building, sustaining, and improving the nation’s capacity to prepare for, protect against, respond to, recover from, and mitigate all hazards. FEMA offers a variety of earthquake-related resources including reports, handbooks, guides, manuals, software, web-based tools, and instructional materials. These documents contain nationally-applicable technical criteria intended to ensure that buildings will withstand earthquakes better than before. There is a great deal of information that is applicable to historic buildings, although they are not necessarily identified as a separate category. Most of the information is available online at www.fema.gov/earthquake. Information on how to obtain hard copies may be found on the web site. The National Earthquake Hazards Reduction Program (NEHRP) leads the federal government’s efforts to reduce the fatalities, injuries, and property losses caused by earthquakes. Congress established NEHRP in 1977, directing that four federal agencies coordinate their complementary activities to implement and maintain the program. These agencies are FEMA, the National Institute of Standards and Technology (NIST), the National Science Foundation (NSF) and the U.S. Geological Survey (USGS). More information about NEHRP is available online at www.nehrp.gov. Antonio Aguilar, Senior Historical Architect, Technical Preservation Services, National Park Service, revised Preservation Brief 41: The Seismic Retrofit of Historic Buildings: Keeping Preservation in the Forefront, originally written by David W. Look, AIA, Terry Wong, PE, and Sylvia Rose Augustus and published in 1997. The revised Brief contains expanded and updated information as well as new color photographs describing the general issues and needs associated with the seismic rehabilitation of historic buildings. The author wishes to thank the following: Melvyn Green, SE, Melvyn Green & Associates, Inc., for his guidance and expertise in the revision of the Brief; Stephen Day, AIA, Stephen Day Architecture, Andrew Phillips, Associate Architect, SMR Architects, and Meredith Wirsching, NCARB, for their input in the initial planning of the revision; Alan Dreyfuss, AIA, Wiss, Janney, Elstner Asssociates, Inc., Loring A. Wyllie Jr., Senior Principal, Degenkolb Engineers, Timothy Brandt, AIA, Senior Restoration Architect, and Mark C. Huck, AIA, Restoration Architect, from the California Office of Historic Preservation, Nicholas Vann, AIA, State Historical Architect, Washington Department of Archaeology & Historic Preservation, Sueann Brown, Regional Historical Architect, Pacific West Region, and Jason Hagin, Historical Architect, Golden Gate National Recreational Area, National Park Service, for their assistance in reviewing various drafts of the brief; and to Charles Fisher, Brian Goeken, Anne Grimmer, Elizabeth Milnarik, and Gary Sachau, Technical Preservation Services, National Park Service, for their help in the final edits of the publication. Illustrations not specifically credited are from National Park Service files. Front cover image: Damage to a ca. 1910 building in Napa, California caused by the South Napa earthquake in 2014. Photo: Wiss, Janney, Elstner and Associates, Inc. This publication has been prepared pursuant to the National Historic Preservation Act of 1966, as amended, which directs the Secretary of the Interior to develop and make available information concerning historic properties. This publication is available from the Technical Preservation Services website at https://www.nps.gov/tps/ or hard copies may be purchased from the Government Printing Offices at the U.S. Government Bookstore. Comments about this publication should be addressed to: Technical Preservation Services, National Park Service, 1849 C Street, NW, Washington, DC 20240. This publication is not copyrighted and can be reproduced without penalty. Normal procedures for credit to the authors and the National Park Service are appreciated. The photographs used in this publication may not be used to illustrate other publications without permission of the owners. Agbabian, M.F. Masri, and R.L. Nigbor. “Evaluation of Seismic Migration Measures for Art Objects.” Getty Conservation Institute Scientific Program Report (1990). American Society of Civil Engineers. Seismic Rehabilitation of Existing Buildings. ASCE/SEI Standard 41-13 (2014). Reston, VA.
California Historical Building Code, California Code of Regulations. Title 24, Part 8. California Building Standards Commission, 2010. Federal Emergency Management Agency (FEMA). 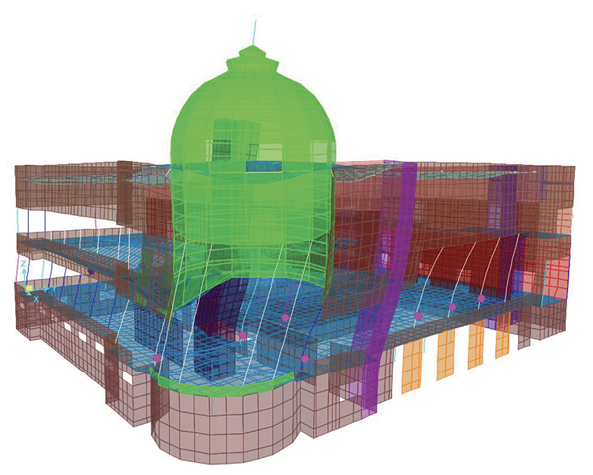 A Benefit-Cost Model for the Seismic Rehabilitation of Buildings. FEMA 227 (1992). Washington, DC. FEMA. Engineering Guideline for Incremental Seismic Rehabilitation. FEMA P-420 (2009). Washington, DC. FEMA. Incremental Seismic Rehabilitation of Retail Buildings. FEMA 399 (2014). Washington, DC. FEMA. Incremental Seismic Rehabilitation of School Buildings. FEMA 395 (2003). Washington, DC. FEMA. Seismic Evaluation and Retrofit of Multi-Unit Wood-Frame Buildings With Weak First Stories. FEMA P-807 (2012). Washington, DC. FEMA. Techniques for the Seismic Rehabilitation of Existing Buildings. FEMA 547 (2007). Washington, DC. International Code Council (ICC). International Existing Building Code (2015). Falls Church, VA.